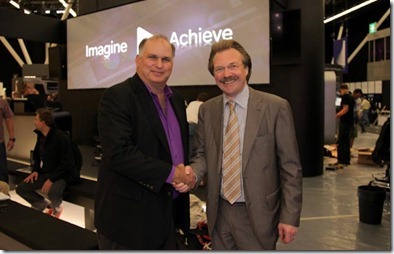 As the exhibit hall at IBC opened its doors to attendees on Friday, we were excited to announce that top regional German broadcaster, Westdeutscher Rundfunk (WDR) has completed a four-year end-to-end tapeless workflow installation Based around the Avid Interplay asset management system, Avid ISIS shared storage solution and Avid Media Composer edit suites, this workflow will enable journalists in WDR’s 10 regional studios to centrally access, edit and play out its news and current affairs programming. WDR’s regional studio Aachen is the tenth and final studio in North Rhine-Westphalia (NRW) to be equipped with Avid digital solutions to produce its news and current affairs program content, and is expected to go live in early 2012. “We have relied on our partnership with Avid since the beginning of our regional studio modernization program in 2007 . . . Thanks to Avid Interplay, all journalists in our regional studios can access and screen their material with the help of Avid Assist. In addition, we are using Avid Airspeed as a playout system for broadcasting,” says Reinhold W. Vogt, chief department manager production NRW at the WDR broadcasting centre in Düsseldorf. For more details about this impressive installation, be sure to check out the the IBC Show Daily.